Obelisk is a MIDI plugin instrument that harmonises input MIDI and outputs it to your synths. It is designed to be a flexible way of experimenting with chords and harmonies. 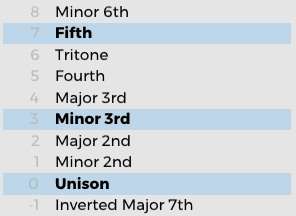 Obelisk's chord picker allows you to pick what harmonies should be applied to each note. As well as this, Obelisk features an optional constraining algorithm that will ensure the harmonies fit your chosen key and scale. View more products from the FrozenPlain label here. Obelisk is a VST or AU plugin. Please read the technical details section for requirement details. Obelisk is a MIDI instrument designed to make it easy to experiment with harmonies. Being only MIDI, it can connect to any synth that you like. As you play keys into Obelisk, each note will be harmonised with the intervals that you pick. As well as this, Obelisk can be set to constrain all output to a given key and scale meaning it will be guaranteed to fit the rest of your music. For instructions for setting up Obelisk in your DAW visit the instructions page. In order to allow you to switch between different chords, keys and scales as you play, Obelisk features 4 identical channels. Each channel can be set up with a chord of your choosing and can be assigned a keyswitch. As you play, pressing the keyswitch switches the channel and therefore allows you to mix different chords, keys and scales in the same performance. As a handy means of identifying the channels, a name can be typed in for each. Obelisk features a very easy to use chord picker. By simply selecting the intervals any harmony can be created. As a starting point there are many chord presets ready to use. When Obelisk is set to constrain mode, the chords are shifted to fit into the given key and scale. Works with Logic X or a VST2 host (for example: Cubase, Ableton Live, Reaper, FL Studio, Studio One, Cakewalk Sonar, Bitwig, or many others). Please see our plugin format page for more info on the plugin formats. Obelisk needs to be able to have its MIDI output routed to a sound generator, see the instructions page. Requires Intel Mac OSX 10.7 or above (64 bit), or Windows Vista or above (32 or 64 bit). OBELISK TOOK ME FROM AN OK SCORER TO AN AWESOME ORCHESTRAL ARRANGER.